JetBlue’s Newest Destination is... Good! JetBlue's Newest Destination is... Good! Customers Can #CheckInForGood Online and at Pop-up Kiosks to Enter For an Opportunity to Join JetBlue on a Four-Day Service Trip to Destination Good. NEW YORK--(BUSINESS WIRE)--JetBlue (Nasdaq: JBLU) today announced that it is putting good on the map. Literally. To celebrate the airline’s nonstop commitment to giving back and good deeds, JetBlue is adding a new destination to its network this November — Destination Good. As part of JetBlue For Good Month, JetBlue is flying a plane full of winning do-gooders to Destination Good for a volunteer experience departing on Giving Tuesday, November 27. The twist? The actual location won’t be revealed until the morning the contest winners depart from New York’s JFK International Airport. To learn more click here. 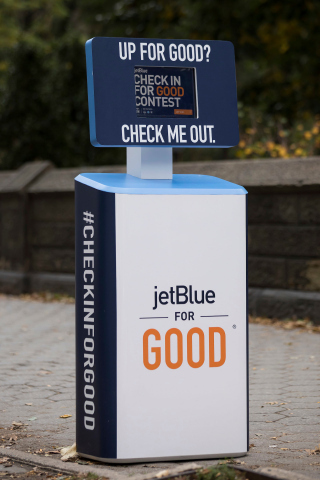 Building upon last year’s Check In For Good campaign, JetBlue is inviting U.S. customers to #CheckInForGood now through October 26 at https://jetbluecheckinforgood.com (a) for an opportunity to win a trip to volunteer alongside some of the airline’s crewmembers and non-profit partners. While visiting Destination Good, guests will participate in daily volunteer and service activities focusing on the three pillars of the JetBlue For Good platform: youth and education, community and the environment. To enter, entrants can fill out a short questionnaire about what “Good” they have to declare online at https://jetbluecheckinforgood.com from October 16 – 26, 2018. Additionally, JetBlue check-in kiosks will pop up in surprise locations in New York City and Los Angeles at select times throughout this time period. Visitors to the kiosks will be able to fill out the same contest questionnaire for an opportunity to win. Up to 50 entrants will be selected to join the trip, with a guest, to participate in three memorable days dedicated to JetBlue For Good’s three philanthropic pillars – youth and the environment, education and community. 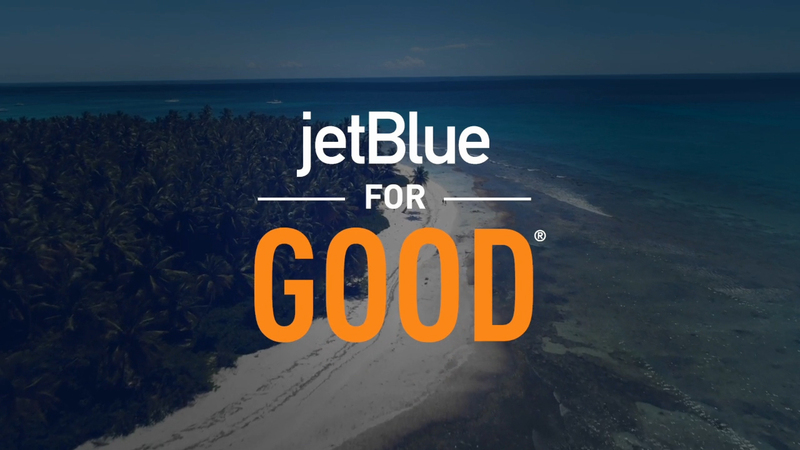 Destination Good is the latest effort of JetBlue For Good, the airline’s platform for social impact and corporate responsibility as part of the airline’s ongoing mission to Inspire Humanity® both in the air and on the ground. Centered on volunteerism and service, JetBlue For Good focuses on the areas that are most important to the airline’s customers and crewmembers - community, youth and education and the environment. Combining JetBlue’s corporate efforts with its customers’ and crewmembers’ passions, the common theme is Good – JetBlue For Good. To learn how to check in for the opportunity to visit Destination Good, go to https://jetbluecheckinforgood.com. For more information about JetBlue For Good, visit jetblueforgood.com. JetBlue is New York's Hometown Airline®, and a leading carrier in Boston, Fort Lauderdale-Hollywood, Los Angeles (Long Beach), Orlando, and San Juan. JetBlue carries more than 40 million customers a year to 103 cities in the U.S., Caribbean, and Latin America with an average of 1,000 daily flights. For more information, please visit www.jetblue.com. (a) NO PURCHASE NECESSARY. Must answer philanthropic-related questions to enter contest. Answers will be judged to determine winners. Open to legal residents of the 50 U.S./D.C., 18+. Must have valid passport and be able to travel on dates determined by Sponsor. Void outside 50 U.S./D.C. & where prohibited. Contest starts 12:00:01 AM ET 10/16/18; ends 11:59:59 PM ET 10/26/18. See Official Rules at https://jetbluecheckinforgood.com for complete details.